Before I start, I have a little housekeeping matter to discuss. This past Thursday, my facebook world went through, ahem...let's call it an adjustment. For whatever reason, the website seized my personal profile as Foodie Stuntman and forced me to convert it to a facebook page, so everyone on my friends list are now 'Likes' to Foodie Stuntman, the page. As soon as I can replicate the content that was in the old personal profile, I plan on deleting the page and I won't be updating it any further. In addition, I've opened a new facebook personal profile under DB Stuntman and I ask you send me a friend request there, if you wish and haven't done so already. My Crazy Foodie Stunts facebook page, twitter, pinterest and G+ are unaffected. Moving onto the dish: I remember watching America's Best Cook on Food Network last spring where one of the challenges was to prepare a burger. It occurred to me that I hadn't addressed the concept here so I prepared one this past August but it had influences and flavors from other cuisines and I wanted to address the dish from a classic American standpoint. The opportunity arose with this week's #SundaySupper theme of Red Carpet Party hosted by Katie of Ruffles and Truffles. You might be asking yourself right now, How does a burger relate to the Oscars? so let me make the connection. The only nominee in this year's Best Picture category that I've seen is American Sniper. In it, Bradley Cooper plays the title role of Chris Kyle who was born and raised in Texas. I then started to think of food The Lone Star State does well and thought of steakhouses, so I started looking at steakhouse menus, where burgers are common as a happy hour item or appetizer. So let's discuss this classic American staple. For me, the toppings are secondary to the burger patty. I used bleu cheese, mushrooms, onions and bacon in this instance, but if you want to replicate this dish, feel free to adjust them to your tastes. My father taught me to use 80/20 ground beef because anything leaner will result in a dry burger because there is little fat to render during the process of cooking it, which makes the burger juicy. I further fortify my burger with freshly shredded parmesan cheese, which is my secret ingredient. In addition, parmesan is naturally salty so it also seasons the patty. Demonstrate my burger recipe and to compare it with others. 1. Prepare the burger patties: In a large mixing bowl, combine the ground beef, parmesan cheese and garlic, then season the mixture with salt and pepper. Form the mixture into patties slightly wider than the slider buns, about 1 dozen. 2. Prepare the toppings: Place the batons in a dry sauté pan over medium heat and cook until crisp and the fat has rendered, approximately 5 minutes. 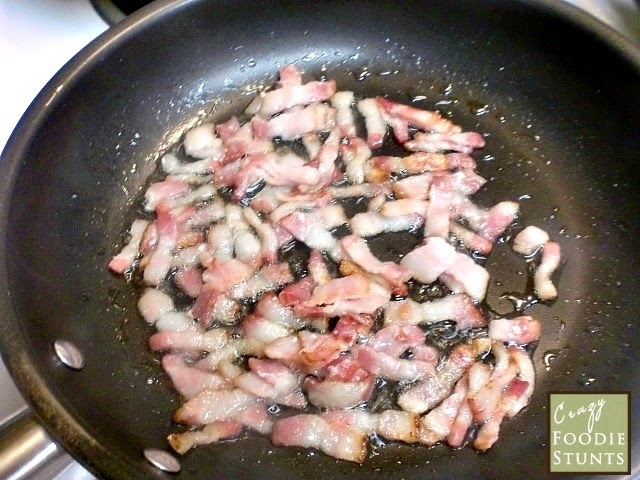 Remove the bacon to a paper towel-lined plate and drain the bacon fat from the pan then replace it with the olive oil and butter. 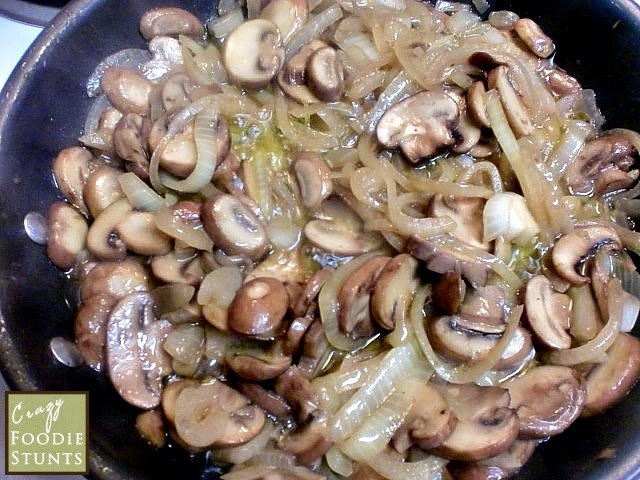 Once the butter has melted, add the onions and mushrooms and cook until the onions have browned and the mushrooms have reduced, approximately 20 to 25 minutes. Season with salt and pepper to taste, then remove to a bowl and set aside to keep warm. 3. 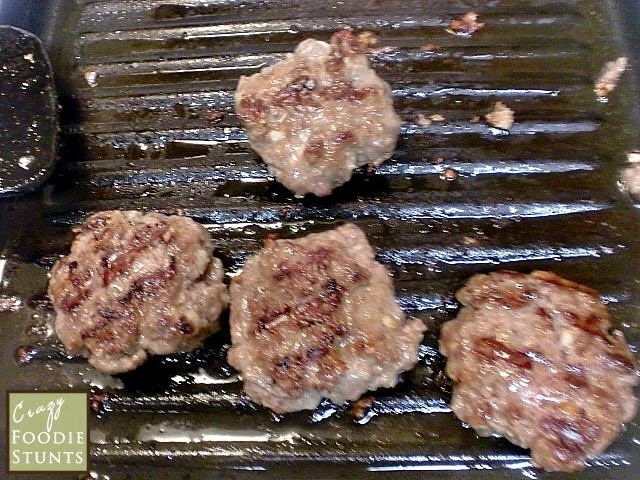 Prepare the burgers: Heat a grill pan over medium heat. Sear the patties until cooked through to desired doneness, approximately 3 minutes per side for medium rare. 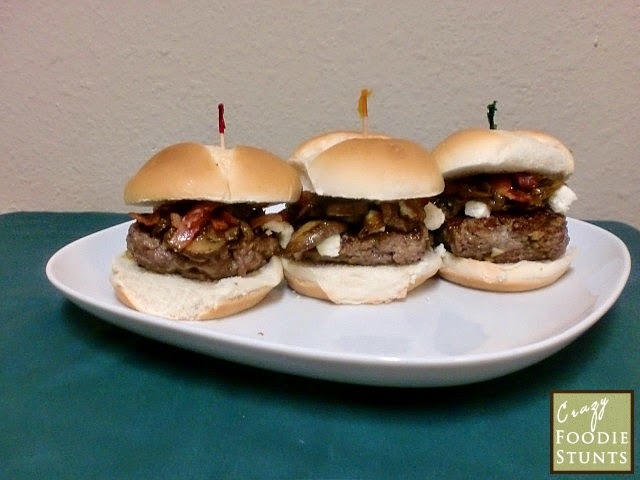 To plate, place a burger patty on a slider bun and top with onions, mushrooms, bacon and bleu cheese. Serve immediately. From the standpoint of the dish itself, Mrs. Stuntman asked if there were any leftover sliders to take for a brown bag lunch the next day after polishing off a couple of them for dinner. Whether or not the challenge was successful is still undetermined because I would need to put my burger patties up against any other home cook's patties. Recipe contest anyone? Let me know if you're up for it. Oh my goodness! You already got me at blue cheese, then I read bacon and I almost fainted!!! I know "I" would give your sliders a big shiny statue!! They look fabulous! This is a perfect burger - mushrooms and blue cheese always get me! And I love the addition of parmesan in the burger! This is like all of my husbands favorite things on one slider....definitely making these for him soon! YUM! Ohh this is a slider!!! It has all my favs! I will def be making this!!! Wow - blue cheese and bacon - these are definitely Oscar-worthy burgers! Caramelized onions are the perfect burger topping! My husband thinks caramelized mushrooms are the best burger topping - you've got us both covered with these sliders. Great recipe this week. YUM! I like how you pay homage to Texas and The American Sniper with this dish! What a wonderful idea! Well the toppings may be secondary to you but I love every single topping you added. My mouth is watering right now. Those sliders have everything I love on them, nicely done!! I love sliders and love the story on how you decided to make these for the red carpet party. I adore slider sized food. These are going to be tasty little morsels. Great minds think alike is right!! I just love finger foods I guess! I love LOVE the topping on this slider! I'm pretty sure this burger would win any burger competition. Love everything you've added, DB! Between the mushrooms, the bacon and the blue cheese... OH MY! These are making me drool... YUM! I love burgers, and a truly well made burger is a joy! Love the parmesan idea. I have to say, I think the topping make the burger, they aren't secondary. However, I never thought to add Parmesan cheese to my ground beef mixture and it sounds really good! Sliders are the perfect party food! Adding mushrooms and bleu cheese sounds amazing! Fantabulous tie in to the Oscars, DB. I've yet to see American Sniper but would like to see the film...But, first I'd LOVE one of your sliders with bleu cheese and mushrooms...The topping might be secondary but you've made stellar tantalizing choices! Mmm, forget the red carpet, these need to be on my table now! I could make a meal out of these sliders. Them and a glass of red wine - perfection! DB - these sliders look fantastic. I know my family would love them! These sound so amazing! And I think the mushrooms and blue cheese elevate sliders to fancy Oscar-party-worthy fare!